Taking the time to do some puppy planning will only be beneficial in the long run for your and you new, or soon to be, addition to the family. The trials of parenthood bridge cultural gaps and, in some cases, bridge species. 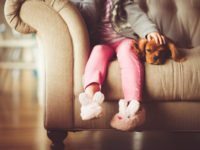 Whether you have a child or a four-legged family member, or plural of either, you are well aware of the joys and hardships of parenthood. Children and puppies have a lot in common. They both are adorable, and even more adorable when they’re someone else’s and not your responsibility in the middle of the night when they use the bathroom. They both have an adventurous nature, like when your little one climbs the shelves in the closet and sends you into a frenzied panic, accompanied by a heart attack or when the puppy discovers the wonders of the bathroom, trashcan and the toilet paper alike. They both don’t have the best communication skills and, to them, we might as well be speaking a foreign language. Puppies, just like children, are not blank slates – they each have their own personalities. Besides the fur, babies and puppies differ in one large way: the rate at which they mature and age. Puppies begin walking and exploring their surroundings before our little ones have even begun to sit up by themselves. Being a new mother and working at a dog daycare and dog kennel in Northern Kentucky, I have had the opportunity to see first hand how the developmental timeline for puppies is so critical and is much shorter than with children. By 21 weeks, 5 months of age, a puppy is no longer a puppy, but has reached the adolescent stage. Ensuring that a puppy is well socialized is the first step toward having a well-manner family dog and this socialization needs to happen puppyhood. Otherwise things such as fears, phobias, anxieties and aggression can potentially develop. Having your new furry family member join a puppy daycare or doggie daycare is a great opportunity for socialization. Your puppy can play with other puppies learning social skills, bite inhibition, and playground manners. All in a safe, supervised environment. Besides doggy daycare, finding appropriate long term care solutions so your furry friend is comfortable while you’re vacationing, isn’t a bad idea either. Working at our facility for dog daycare and dog boarding in Northern Kentucky has really opened my eyes. Never have I taken so much pride in my workplace. We work hard to help all of the dogs in our care to have a positive experience. We watch for signs of stress and discomfort to make sure each dog is getting the care and treatment they deserve. Especially in regards to dog boarding, since it is for extended periods of time, you never just drop them off and hope for the best. Whether you’ve just added a puppy to your family or are considering adding one in the future, taking the time to do some puppy planning will help relieve some of the stress that will inevitably come with a little furry family member as time goes on.